I am aware of elphel’s teardrops patch but I cannot see it coming in the devel mailing list. Since I’m not a C++ dev, I have modified svofski’s python script in order to make it fit my needs. The script is here and implements teardrops using zones. This allows the DRC rules to be respected (you only need to rebuild all zones). It also keep track of generated teardrops in a file in order to delete them afterwards. the OpenGL (as well as Cairo) mode shows some artefacts in the teardrop zone. The default mode does not show any problem. Gerber neither. Does anyone know how to solve this or can give me some pointers ? How to add tear drop in kicad? I will add a method in script to fix the saved file. Teardrops are a great idea, but I’ve found arc geometry teardrops give the best results, for clearance to nearby PADS, and allowing larger teardrops. Not sure if you can support ARC as an option ? if they feels it necessary they ask for permission to add it. I am actually working on it right now. It is a bit complex but I think I will be able to get something quite quickly. 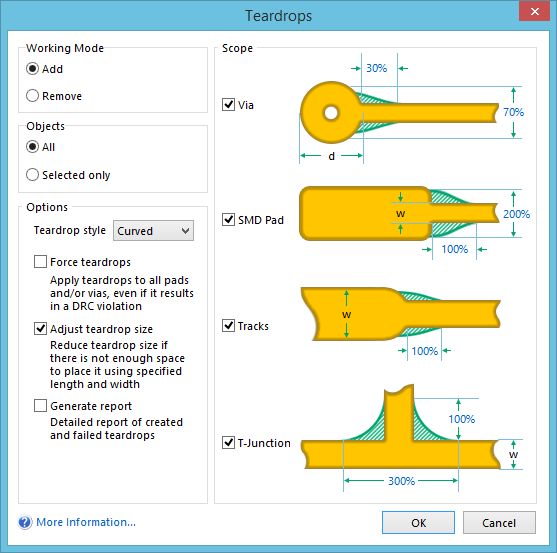 Teardrops are a great idea, but I’ve found arc geometry teardrops give the best results, for clearance to nearby PADS, and allowing larger teardrops.Not sure if you can support ARC as an option ? This is clearly possible. The only drawback is that it will generate complex zones for each teardrop. Nevertheless, can you (or anyone) give some references about the arc radius ? I am not able to find anything. For sure, that’s why I want it ! This is how PADS layout sets ARC teardrops. You can see how much closer other pads/vias/corners can be placed, with curved teardrops. It does not need a lot of segments to approximate the arc, maybe 5 or 7 a side ? I wonder if KiCad scripts can trawl the DRC error reports/tags, as then a 2 pass could be possible, where offending teardrops are removed or adjusted. PADS can also generate teardrops on angled entry into oval pads. I think there is arc support for tracks coming. Someone who does RF circuitry has got code working that does arc tracks… but I have no idea about how far away that is from implementation into the official branch. @cbernardo, @keruseykaryu, @madworm or @caer will probably know more about the status - if there is any. I'm trying to write a script to generate traces for microstrip filters for import into KiCad. It looks like the "polynomial shape for microwave applications" tool in the microwave toolbar may make this possible. However, I haven't found any documentation on the syntax of polynomial shape tool shape description files. Do any of y'all know of any documentation on the microwave toolbar, or of any examples of shape description files? Interesting, but that’s a ways-off, and a simple polyline segmented ARC approx will work now. If course if full ARC entity support arrives, it will be easy to add. Note that other CAD pgms have only modest ARC support, - for example, shove with ARC preserve is missing in Mentor. any news from your side about the script? I only have to make it readable and clear before releasing it. This might be done by the end of the week. It took me much more time than I initially though because I became father ten days ago which did not let me much brain time available. I am now struggling with github to import my personal ssh-only hosted git repos. This will be much more efficient to share it here. CONGRATS!!! I can understand your happiness and brain storm!!! @maui: Thank you very much! This is all new to me and I really enjoy it! I managed to get the script done this evening. I created a github account for the occasion: https://github.com/NilujePerchut/kicad_scripts/tree/master and uploaded the script on it. The readme gives some explanations about how to use the script. I hope this will can be useful (and not too much buggy). Thank for all the advices on this thread. I hope this will can be useful (and not too much buggy).Thank for all the advices on this thread. Sounds cool, looking forward to curved teardrops ! If the corrupted file error is solved, you could edit the thread title - maybe add a version number there ? I expect this to be generally useful, and referred to often. Thanks for the modification, this looks better now. As suggested by @PCB_Wiz, I also added the current revision and will keep it synced with the github version. Curved teardrops are now available. The script behaviour is identical to the previous version (0.2.0). Curved style is used by default. The number of segments per curved is controlled by the parameter “segs” of the setTearDrops function (default is 10). If segs is set to 2, straight lines are used. Notice: I am not very good in geometry and the only solution I found is to use a bezier curve in order to keep the teardrop tangent to the track and the via. It works but it is quite expensive in processing time. If someone has a better method, please let me know.